Bill Henderson was born in Vancouver in 1944. He learned guitar and became the guitarist for the Panarama Trio that performed at the Panarama Roof dance club on the 15th Floor of the Hotel Vancouver. He formed the psychedelic pop-rock Vancouver band, The Collectors, in 1966. After a half dozen local hits including “Fisherwoman” and “Lydia Purple” the Collectors name was ditched in 1970. Henderson (vocals, guitar), Claire Lawrence (saxophone, keyboards), Ross Turney (drums) and Glenn Miller (bass) were all Collectors bandmates. After Howie Vickers left The Collectors, they changed their name to Chilliwack. The name was a Salish First Nations name that means “going back up” and is the name of a city in the Fraser Valley in British Columbia. Chilliwack had their first Top Ten hit in Vancouver with “Lonesome Mary” in 1971, peaking at #4 on CKVN. The single also made the Top Ten in Boston and #6 in Boise, Idaho. They released three singles in the next few years variously on the record labels Parrot, A&M and Goldfish with little traction. Chilliwack had their first post-Collectors Top Ten hit in Vancouver with “Lonesome Mary” in 1971. According to Richard Skelly, Chilliwack’s record company, A&M, “fumbled by wasting “Ridin'” as the flip side to “Lonesome Mary”. An ode to train travel, it had a jangly Byrds meets CS&N vibe. Unfortunately, “Ridin'” was the only obvious followup single. Likely, realizing the mistake, A&M supposedly flew the band down to whip off a pair of straight up rockers: “Hit Him With Another Egg” and “Rock n Roll Music. I never heard the finished but never-released product.” Skelly writes that later re-recorded versions of these songs ended up as tracks on a subsequent album, All Over You, but these were not as good as their first recordings. Other albums that followed, Riding High and Rockerbox resulted in few successful singles. 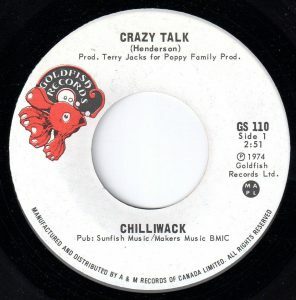 The most successful single during this chapter of Chilliwack was the haunting “Crazy Talk”. “Crazy Talk”, from the Riding High album, peaked in the Canadian RPM singles Top Ten in the winter of 1974-75. The single made #6 in Hamilton, Ontario, and the Top 20 in Toronto and Peterborough, Ontario. In Vancouver it reached #11 in January 1975. “Crazy Talk” is a song about a woman whose serial lying is crazy making for the man in her life. The singer warns that this woman can “make a man a ruin.” The origins of the word ruin have to do with the remains of a building or a city that has fallen into decay or been destroyed in war, fire, flood or earthquake. Over time the word, ruin, also referred to the downfall, decay, or destruction of anything. Sometimes one’s ruin is brought on by recklessness and carelessness. In the case of this song, there have been men who haven’t been alert to the nefarious qualities of this particular woman. The ruin of a human being suggests the complete loss of health, means, position, hope, or capacity to be restored. The woman in the song talks “mumbo jumbo.” In its modern usage in the song, mumbo jumbo suggests she uses senseless or pretentious language, usually designed to obscure an issue, confuse a person listening to her. The origins of the phrase go back to at least the 1730s as recorded by European explorers in West African, in what is now the nation of Mali. The phrase is attributed to probably the Mandingo people and the name of a masked dancer, the Maamajomboo, who took part in religious ceremonies. In Mungo Park’s 1799 travel journal, Travels in the Interior of Africa, he describes ‘Mumbo Jumbo’ as a character, whose outfit included a “masquerade habit.” He wrote that Mandinka males would dress up in order to resolve domestic disputes. In the 18th century “Mumbo Jumbo” also referred to a West African god. In the children’s story from 1899, by Scottish author Helen Bannerman, The Story of Little Black Sambo, a young boy from South India, has parents are named “Black Mumbo” and “Black Jumbo.” In Alex Haley’s 1976 book, Roots, the Mumbo Jumbo is mentioned in the context of tribal men disciplining disobedient wives. The woman is like a monkey on the man’s back. What is it to have a monkey on your back? In 1822, Thomas Gillett published a collection of stories as The Midland Minstrel that included a tale called “The Devil and the Doctor.” The story concerned some students who teach their overzealous instructor a lesson by dropping a monkey on his back while he’s riding his horse home one night. He’s convinced the monkey is the devil and, after a mad dash through town, sees the error of his ways. In 1807 Pierce Egan wrote about early circus acts around 1800 in Europe and America in his book, Sports Anecdotes. He refers to monkeys riding the backs of horses, ponies and show camels. In most of these anecdotes, the monkey is either frightening the animal or symbolizing its subjugation as being under the control of the circus master. A monkey on your back is a burden that might involve anything from a mortgage to an addiction to a difficult relationship pattern. The alliteration of mumbo jumbo, monkey… works well in the song. And, though a radio listener might not know exactly what the origins of mumbo jumbo or monkey on your back mean, the growing list of things the woman manifests help us agree that she will make a man a ruin. What is it like to be in a relationship with someone whose words you can’t trust? The man in the song likely knows from first hand experience what it is like to be out of control of your destiny and far from having any sense of balance. 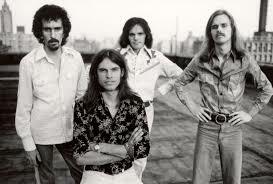 In 1977 Chilliwack recorded their sixth studio album, Dreams, Dreams, Dreams. At the time the band members were all Scientologists, according to Bill Henderson’s liner notes on a 2013 reissue of the album. And in 1977 there was a dedication to the founder of the Church of Scientology, Ron L. Hubbard, on the back of Dreams, Dreams, Dreams. By 1977 the bands musicians consisted of Henderson, Turney, Miller and Howard Froese on guitar, vocals, solina and piano. The album contained a series of successful singles including “California Girl” and “Fly At Night”. Chilliwack continued to release albums and singles over the next few years. But it was their ninth album, Wanna Be A Star, that definitely made them stars. They charted their only two Top 40 hits on the Billboard Hot 100 with “My Girl (Gone, Gone, Gone)” and “I Believe”. In 1982 Bill Henderson won the Juno Award for Producer of the Year for the Chilliwack album Opus X.
Egan, Pierce. Sporting Anecdotes, Original and Selected; Including Numerous Characteristic Portraits of Persons In Every Walk of Life, Volume 1. Johnstone & Van Norden, New York, NY, 1823. Gillet, Thomas. The Midland Minstrel (1822). Kessinger Legacy Reprints, Whitefish, MT, 2010.